The first cookbook that was ever really mine was ‘The Better Homes and Gardens ‘New’ Cookbook’ published sometime in the 70’s. It was and remains a great primer with some basic information for all cooks including weights and measure and substitutions but by today’s standards it would most likely earn nary a consideration by many cooks. No big celebrity or chef endorsements and few photos; nope…just some great basic recipes. Many I’ve made time and time again that are still favorites including a Hamburger and Baked Bean Casserole that was a staple when my kids were growing up, my favorite strawberry pie that I have updated a bit but the concept of mostly crust and berries has not changed, and this perfect Sour Cream and Bacon Potato Salad. Truth is, that particular book was in storage while my life is in limbo in 2013 and I’ve still yet to unpack all my books here but I’ve made it so many times over the years, I’m sure at least once every summer, that it’s now simply held in my heart. I’ve made it to woo a boyfriend when I was young, made it for picnics with other young marrieds, made it for barbecues held at my home and made it for my daughter’s backyard graduation party. Most recently it was made for a group of neighbors getting together on Sunday afternoon for some burgers off the grill and this was, as it often is, my contribution. I could have called it ‘The Best Potato Salad Ever‘ for I really think it is…and I’ve made some changes over the years that I want to believe have enhanced the original. No longer peeling Idaho potatoes, I simply cut up and use red potatoes, skin and all (what a timesaver LIFESAVER!). Where I once followed the recipe exactly and use bottled Italian salad dressing to marinate the potatoes after they cooked, I now prefer to whisk together some bacon fat (oh yeah), olive oil, vinegar and herbs from the garden for an even fresher (and better) taste. I did learn through experimentation though that as good as balsamic vinegar tastes, it’s not a good choice. Tan potato salad is just not so pretty! Still the main ingredients rule…some egg, some bacon, some sour cream and no doggone, whoever decided that it belongs there anyhow, RELISH. No. None. Zip. Nada. Zilch. By the way did you know that old fashioned Pyrex bowls are a BIG DEAL? My daughter and her friends hold swaps, yearn for ones they see on Pinterest and there are definitely bragging rights if you score a set like you see in this post. These belong to my friend Karen who let me borrow them for this old fashioned recipe that is still my favorite today. Did she know anything about how popular they’ve become? Heck no, these are simply a wedding gift that they have now used for over 30 years! Who knew? Certainly not Karen. Or me. How about you? Are you one of the new Pyrex fanatics? It seemed most appropriate to use these bowls; they and this recipe are of the same generation and they are a great example of ‘What’s old is new again.’ Try it…you’ll see, it’s the BEST!! Herbs of your choice - I used 6 basil leaves, 1 sprig of fresh rosemary and about 2 Tbsp of fresh thyme; all chopped. 4 large eggs, hard boiled. Separate yolks from whites and chop whites. Combine the bacon fat, olive oil, vinegar, herbs and garlic salt in a small food processor or shaker jar and combine well. Mash egg yolks finely with a fork in a medium size bowl. Make the dressing by combining the yolks with the mayonnaise, sour cream and Dijon mustard; mix with a whisk and season with salt and pepper. Add dressing, chopped egg whites, bacon and green onion to potatoes and mix gently. Taste and adjust seasoning with salt and pepper if necessary. Refrigerate for a minimum of one hour before serving; best if made ahead and refrigerated overnight. Garnish before serving with green onion and bacon bits. If it’s Thursday it must be time for the Food Network #SummerSoiree. Today it’s one of my favorites; potato salad. I love this potato salad and others too and imagine I’m going to want to make every single dish on this list from our other contributors. Perfect time of year and enough barbecues and picnics I bet we could do just that! My two favorite ingredients to use with potatoes, there is not a week that goes by when we don’t have some sort of potatoes with bacon and sour cream. 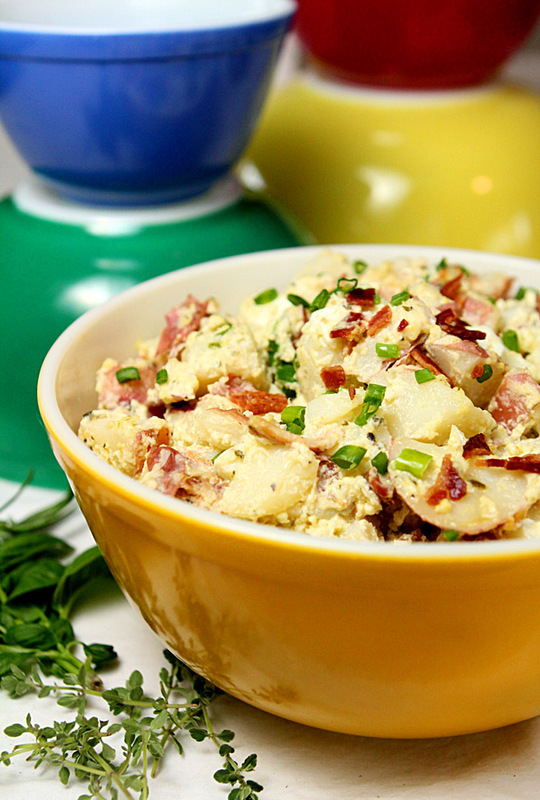 I love potato salad but potato salad with bacon, even better! Sounds so good! Perfect timing too! Yes I love old Pyrex, I spent ages perusing eBay in the UK and managed to get an old Cinderella Pyrex bowl, wonder how it ended up over there? Well of course it’s here with me now and I still watch out for more of the old Pyrex bowls! Delicious! I usually just let my hot spuds marinate in some vinegar while still hot, but I love your more complex marinade. And yes to the bacon grease! Thank you for sharing. I will definitely try it. I made this salad yesterday and everybody loved it. I will definitely make it again. So glad to hear; it’s been my favorite for many years and nothing comes close if you ask me! Enjoy. This potato salad looks lucious! I am always asked to bring potato salad to family potlucks, and I will try this one next time, as well as my old stand-by. I have a set of these bowls that I collected one by one. I’ve done that for my sister in-law, and daughter, too. My mother received a set for a wedding present back in 1947, and they are still intact. She always said she wouldn’t have been able to cook if she didn’t have them. I’ve been making it forever and nothing else measures up for me; but then I don’t love relish and I do love bacon! Funny how those bowls are now collectors items isn’t it? It’s early in the morning i read this recipe sour cream and bacon potato salad my sister love to cooking in home and this delicious recipe i must be share soon with my sister thank you so much for this lovely post with amazing picture..
You are most welcome Sara…enjoy! My mom had those same Pyrex bowls! Wonder if she still does? I’ll have to ask her. You have to let me know…they are all the rage now. Where? Pinterest of course! Thank you…as my vegetable garden shrinks I’ve compensated by growing more and more herbs! The Better Home and Gardens cookbook was one of the first cookbooks that I purchased, mainly because it often made appearances in both my grandma and mom’s kitchens, so I knew it was reliable. It was such a great guide for me when I first started cooking, and I think it really helps with fundamentals and gives you a good base for getting more creative in the kitchen. I can see why it has been reprinted so many times! The salad looks great! Hey, you could have entered this in the Bacon Takedown! Son of a gun, I could have couldn’t I? It was fun being a judge though; much less pressure than being a contestant! Love this potato salad! I’ve never prepared potato salad with the step of marinating the potatoes but it sounds like it would add such a great flavor. I adore red potatoes too. That’s how I make my mashed potatoes. I love their flavor so this salad is right up my alley. That step must be important because I’ve always just loved this potato salad Kate. My only caveat that I learned through trial and error? Don’t use balsamic vinegar. As much as I love it, it did add a brownish hue to the potatoes; tasted great but not so great in the looks department. Now this is my kind of potato salad! Love all that BACON! That is surely the key to why I love this so much…everything is better with bacon right? 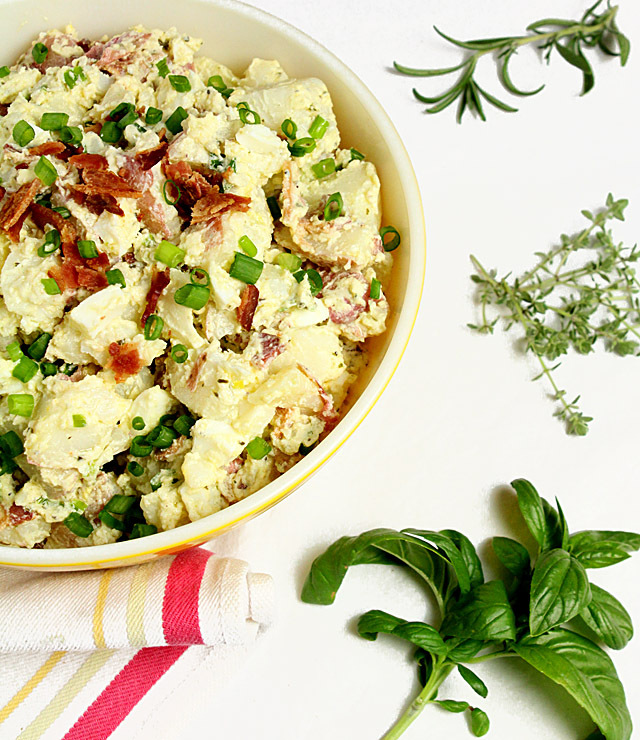 I love potato salad in almost every form and this looks great! So I should tell my mom to not get rid of her pyrex? Just tell her to put it in her will for YOU Abbe…who knew it would take off as a vintage favorite? I found three old cookbooks in my mom’s kitchen cupboard on my last trip home but could only fit two in my carry on luggage so her copy of The Better Homes and Gardens ‘New’ Cookbook from the 60s or 70s is still there, waiting for my next trip back. But I do have a reprint of it and love it! I love the good, old fashioned homey recipes. 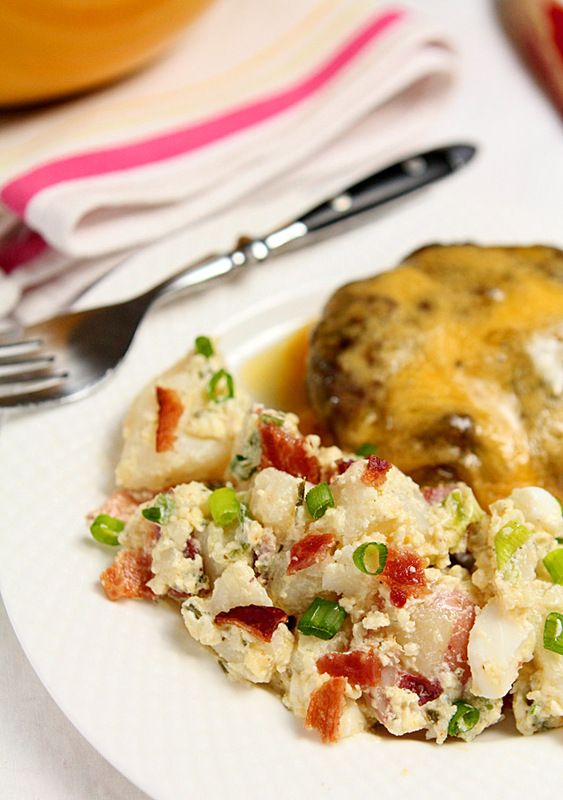 This potato salad looks great, especially with the bacon. This is one of those recipes that’s great the original, old fashioned way or with a new, updated twist. Love the bowls! I love some of the old standards; not those that relied on Cool Whip or canned everything but those that showed that yes indeed, people actually used to cook by scratch in ‘the olden days.’ Aren’t the bowls pretty…Karen has a bunch of Pyrex; she would be a hero to the new ‘I have to have vintage Pyrex’ generation! It really is that simple isn’t it? There is absolutely nothing not to like! THANK YOU Paula. I’ve read some say that relish or pickle juice is the key to great potato salad success and I want to leave a comment. Stop. No. Don’t do it!! Ruins it for me; glad to have a soulmate in that opinion! Yum, baked potato in a bowl. Looks good. Easy for parties instead of making a big baked potato bar. I guess it is Tanya…never thought of it that way but you are so right! I have a Betty Crocker Cokbook that I received as a wedding shower gift and feel the same way about it as you do your Better Homes and Gardens book. Lots of classic recipes, some made better with a few twists but reliable recipes nonetheless. I think I should plan a bbq so that you can bring this to my house! Trouble is I’d have a whole list of foods I’d love for you to bring along…drinks too! I still have my cookbook & it’s probably the same vintage as yours! Use it all the time, especially when my step-daughter asks for tried and true basic recipes! I love the pyrex bowls but alas I have none! My mom has one left from her set and it is a turq-blue and I always want to snag it for it’s size! Maybe Pyrex should do an anniversary edition of them similar to Ball brining back blue mason jars for their anniversary! Oh how very delicious! This is JUST how I like my potato salad… love those flavours, the bacon, the sour cream! Other than my mother’s version, this ranks as the BEST I’ve seen! Do you home deliver? Thanks Liz…I would offer home delivery to you but I fear I would eat it all before I got there. Oops! Terrific looking potato salad! I love the combo of bacon and sour cream. I make a German potato salad sometimes that’s distantly related to this – no sour cream, the dressing is just hot bacon grease and cider vinegar. And you can serve it hot, warm, or chilled. This looks really good – definitely something I need to try. Thanks! Thanks John! I make a German one too; my Grandma’s recipe I think? If it’s German and I make it I probably got the recipe from her! Ever done a French potato salad with olive oil and fresh herbs? You should try it, so light and fresh and for summer a great transportable one; nothing that has to be refrigerated. I had NO idea they were all the rage; but I do love things that stand the test of time and that they have. My daughter scored a couple of pie plates; they will surely make an appearance here soon! My Better Homes and Gardens cookbook still has pride of place in my kitchen. For good stand by recipes, this is my go to. I am ashamed to say that I have never made this potato salad but I certainly will now. That was my first cookbook too. I think everyone owned one of those books. Soon it was covered in splashes of this and smears of that but I kept on using it. I love this potato salad! Exactly…those pages that almost stick together because they’ve been referred to SO many times. Now I’m sort of missing it but then I’m missing all of my stuff; it’s time to buy me a new home!